In addition to advocating for consumers in state laws and regulations, CUB is here to help with your utility questions. 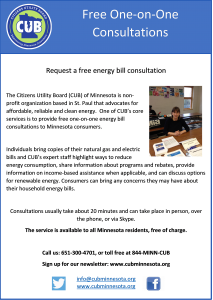 Have a question or complaint about your utility service? CUB’s expert advisers are here for any Minnesota residential or small business utility customer for no charge. Our staff has extensive knowledge of utility policy and can inform you of your rights, while showing you options to save money on your bills. If needed, we can also contact a utility on your behalf. Please don’t hesitate to call CUB, even if you don’t have a question or complaint but something just seems a little fishy about your utility service. You may learn something by contacting CUB, and your call could provide a helpful tip in our ongoing efforts before state regulators for better utility rates and policies. 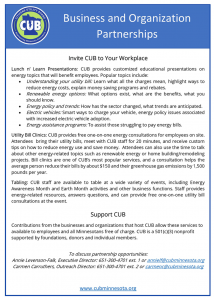 CUB staff will provide educational presentations to organizations, congregations, libraries, community groups, and more that help consumers understand their utility bills, highlight ways to reduce energy costs, and make attendees aware of programs and rebates for which they may be eligible. Other popular topics include energy policy, renewable energy, electric vehicles, and income based programs. Presentations are customized to address specific areas of interest and are free of charge. CUB staff can be available at a convenient location or over the phone during a set period of time. Attendees bring their utility bills for a free one-on-one energy consultation with CUB staff, who will then review their utility bills, discuss ideas to save money or get renewable power. Check our upcoming events page to find any Utility Bill Clinics near your or contact us to set up a one-on-one consultation. 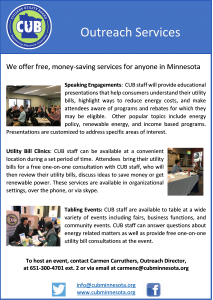 CUB staff are available to table at a wide variety of events including fairs, business functions, and community events. CUB staff can answer questions about energy related matters as well as provide free one-on-one energy consultations at the event. All are welcome at CUB’s public events. Find out about upcoming events and register on our event calendar or feel free to suggest an event in your area if we don’t have one on the schedule through our contact form below.